Green beans…these are so easy to grow and are often prolific producers. So how can you preserve them? 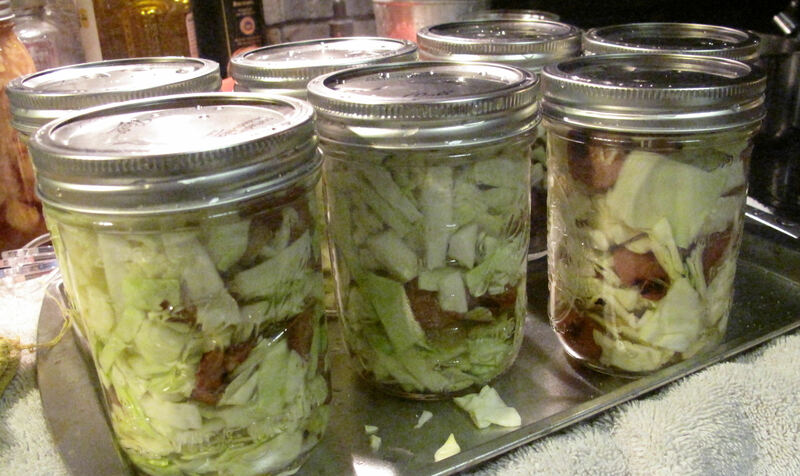 Canning and freezing are our favorite ways. 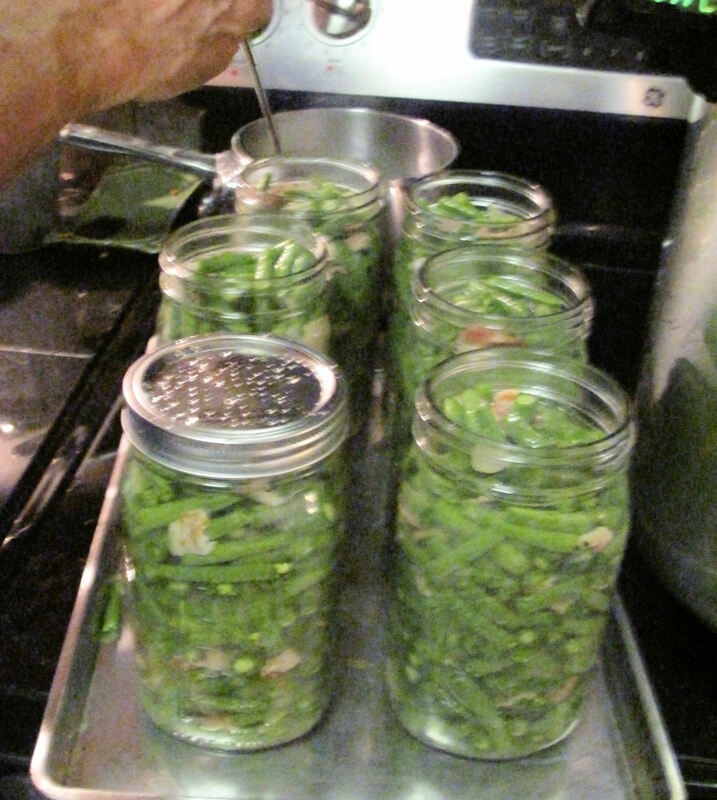 Canning fresh green beans is easy…but VaCreepinOutdoors and myself, we love to can them like our grandmothers did. With BACON! 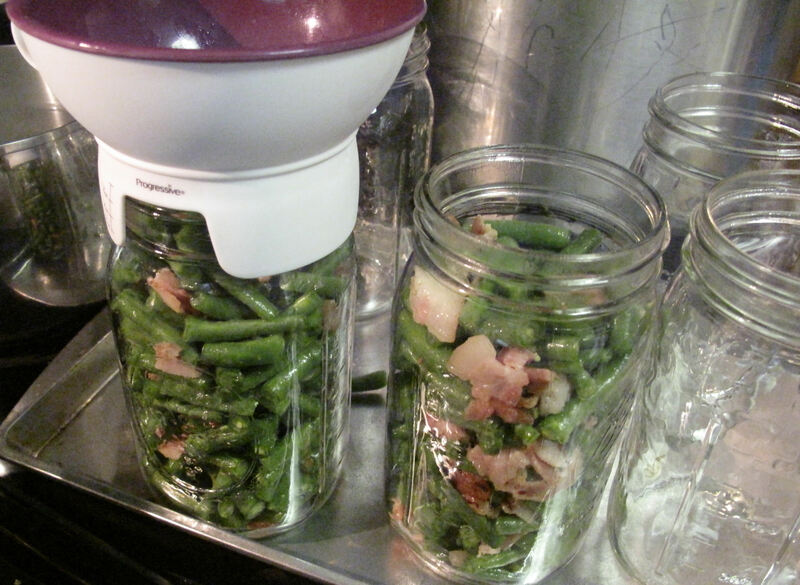 Yes, you can safely can green beans with bacon. My grandmother died when I was 8 years old. One legacy she left was a TON of canned fruits and veggies. My family got some of them and some were pressure canned green beans with bacon. Sadly, I opened and ate the last remaining jar of these about 8 years ago. I am now 42 🙂 and they were still delicious!!! VaCreepin remembers his mom’s and grandmothers canned beans too..so this article is in their memory and we hope you will give this a try and make it a tradition in your family too! 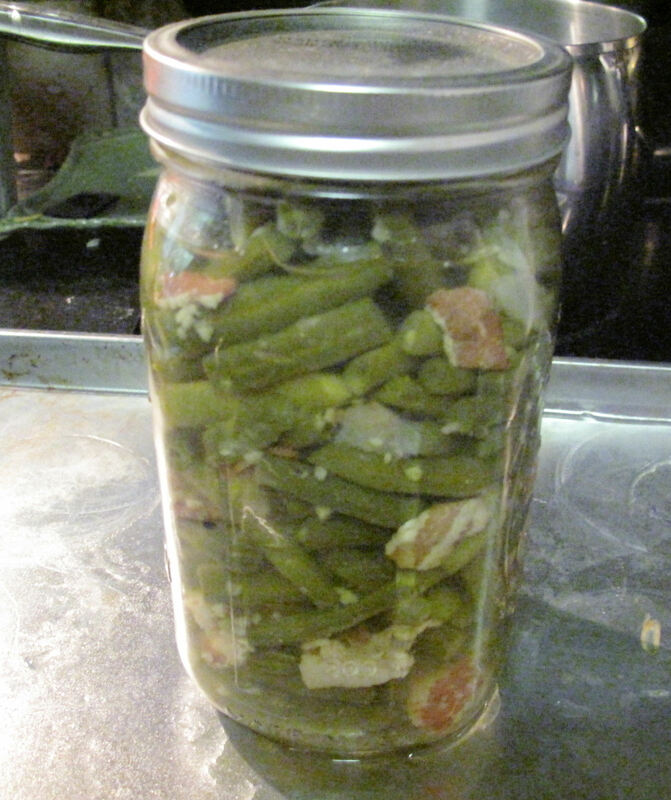 1 quart mason jar (or 2 pints) per pound of green beans. Colander and Large Pot or Bowl. A little bit of vinegar and a small rag. Getting your canning supplies ready to go as usual. With the new lids available now, all you need to do is wash them. No boiling necessary to get the gummy going (in fact, keeping them simmering will degrade the gummy part causing lid failure). Often I will just put the lids and rings into a pot of water, bring to a boil for just a minute or two and then turn down to barely warm just to keep the water warm enough that I can put a finger into the water without hurting myself. A trick I learned with the jars…heat the oven to 250 degrees to keep them ‘hot/warm’. Put the jars onto a cookie sheet and put into the oven while prepping the beans and bacon mixture. Get the pressure cooker water going too. I put 3 inches in and bring to a boil while prepping the beans and bacon mix. Next, we prep the beans and bacon/onions/garlic. 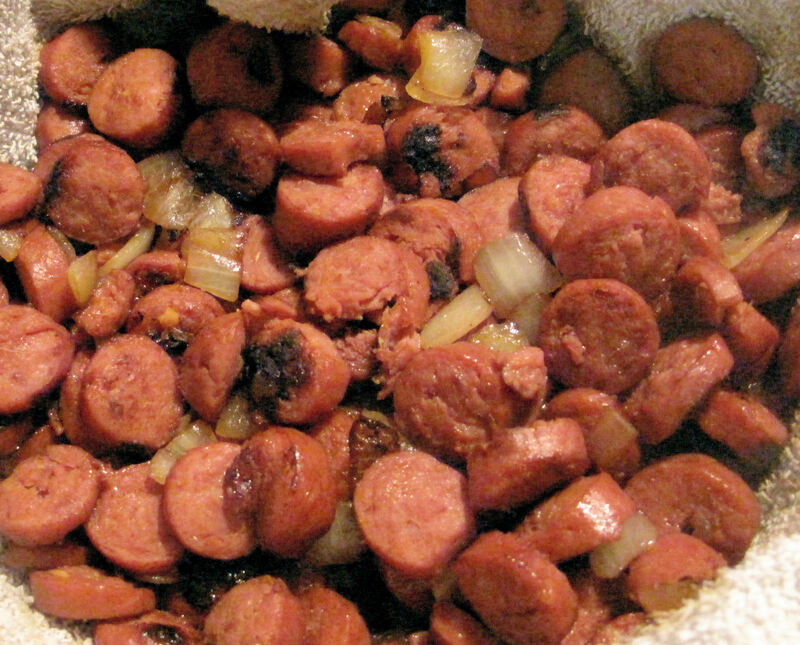 Typically VaCreepinOutdoors will cut the beans up as I fry up the bacon/onion/garlic mixture. The beans should be cut into about 1 inch lengths. Then rinse. We DO NOT parboil them because that causes the beans to become mushy after canning. 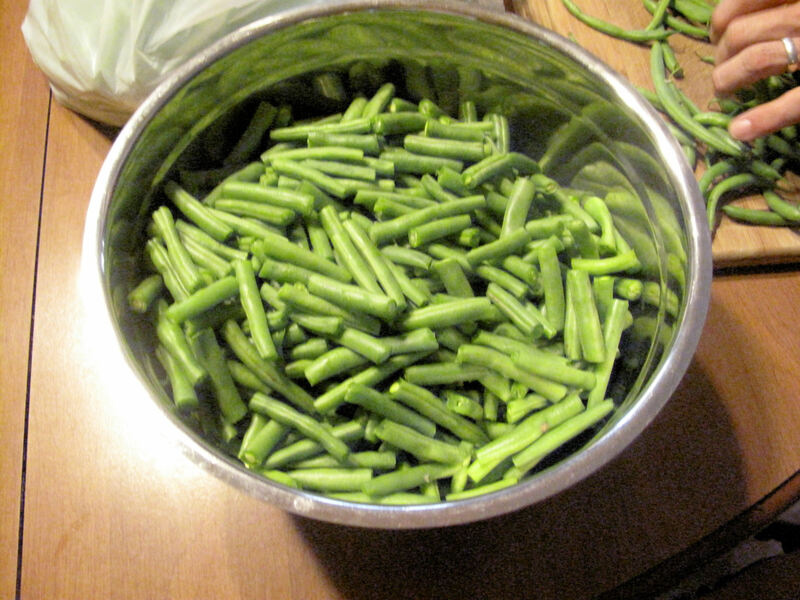 Raw packing is the best method for green beans so they don’t overcook. Remember, you are cooking them when you pressure cook them and then cooking again after opening. No mushy beans here! 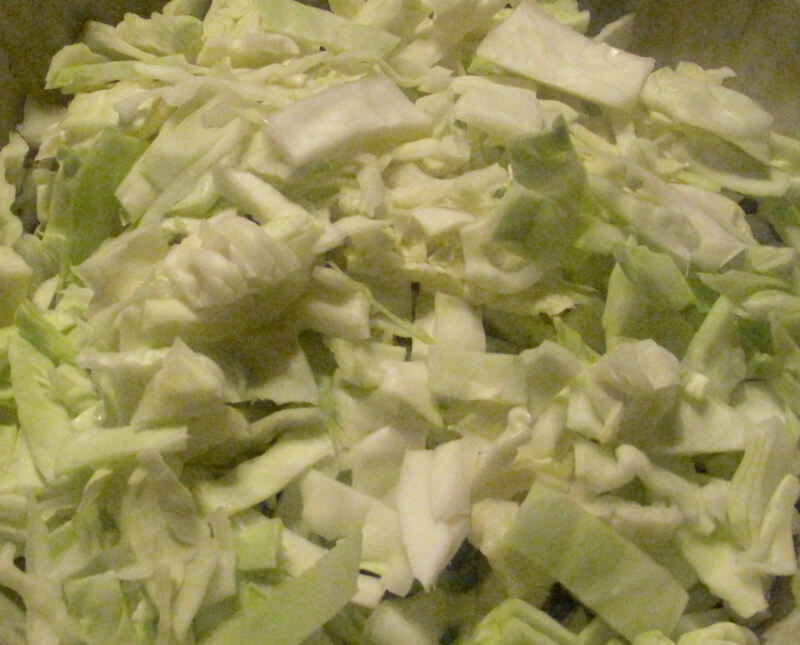 Place the beans into a large bowl or stock pot. 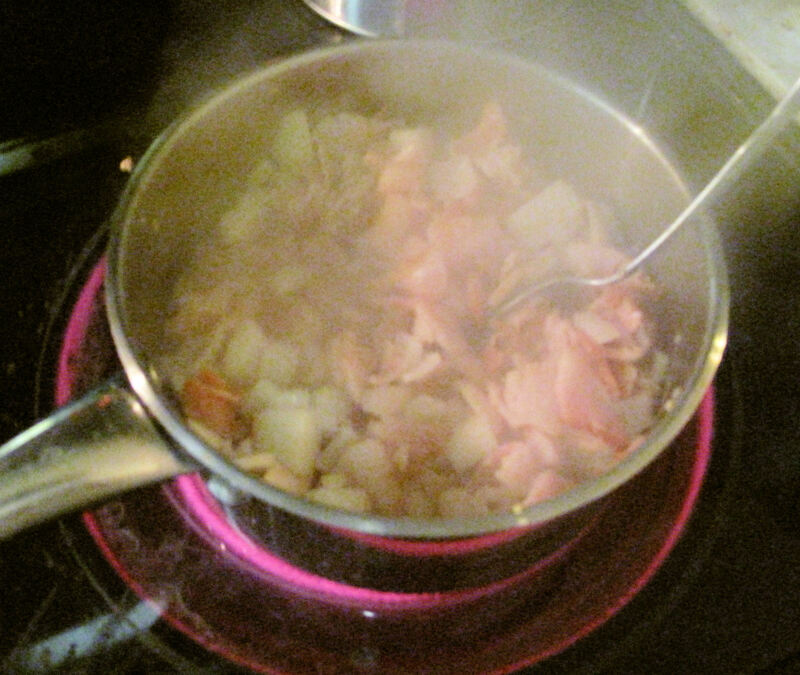 For the bacon, I cut the strips into 1 inch or so pieces, put into a frying pan, add diced onions and the garlic and fry the bacon until its just done/cooked. 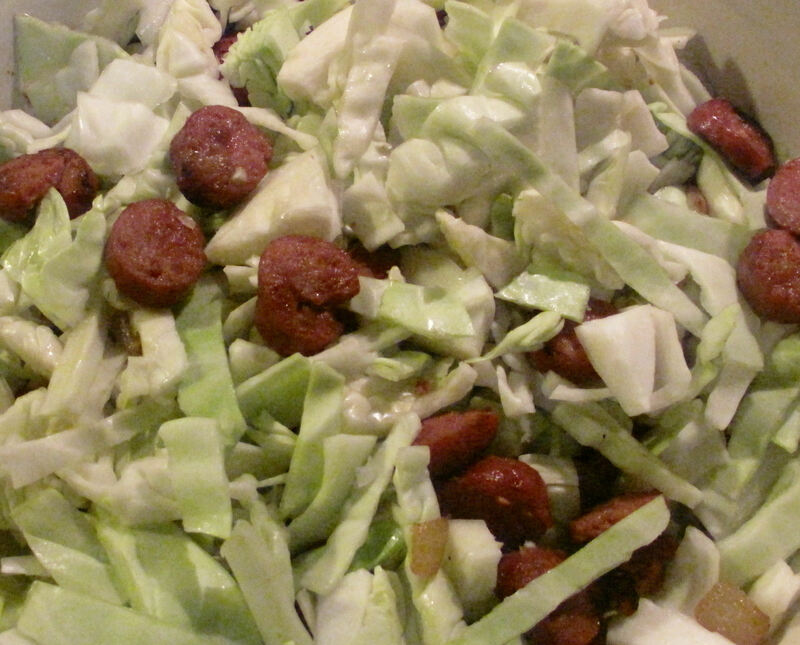 Drain the fat and then add to the beans that are already in the pot. Mix the beans and bacon mixture WELL. Get your preheated jars out and STUFF THOSE JARS FULL of the bean/bacon mix. If you don’t pack them in tightly you will wind up with more water than beans. I use a pestle or something else to pack the beans/bacon down into the jars. Pack leaving ½ inch head space. Now for the best part: no hot water needed…I just take the packed jar over to the sink and fill with water up to the ½ inch mark. 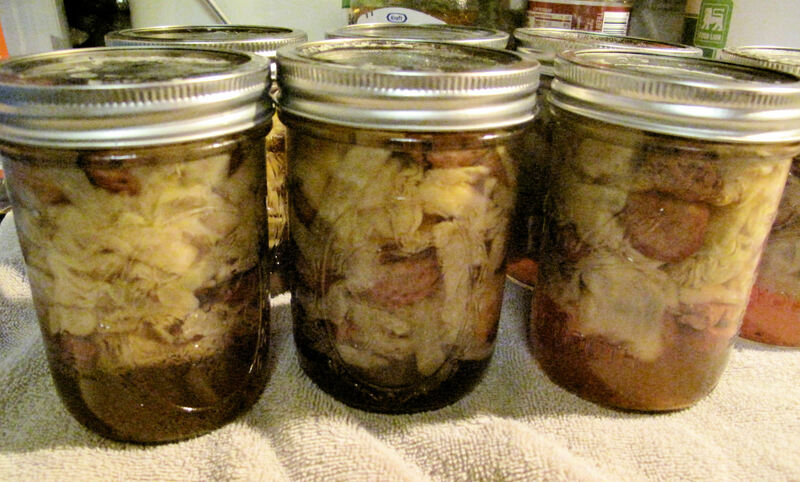 Because we have used bacon in this canning recipe, you will need to put a small amount of vinegar onto the rag. Wipe the rim and where the ring screws down onto. Vinegar cuts the potential grease and cleans the rim very well. 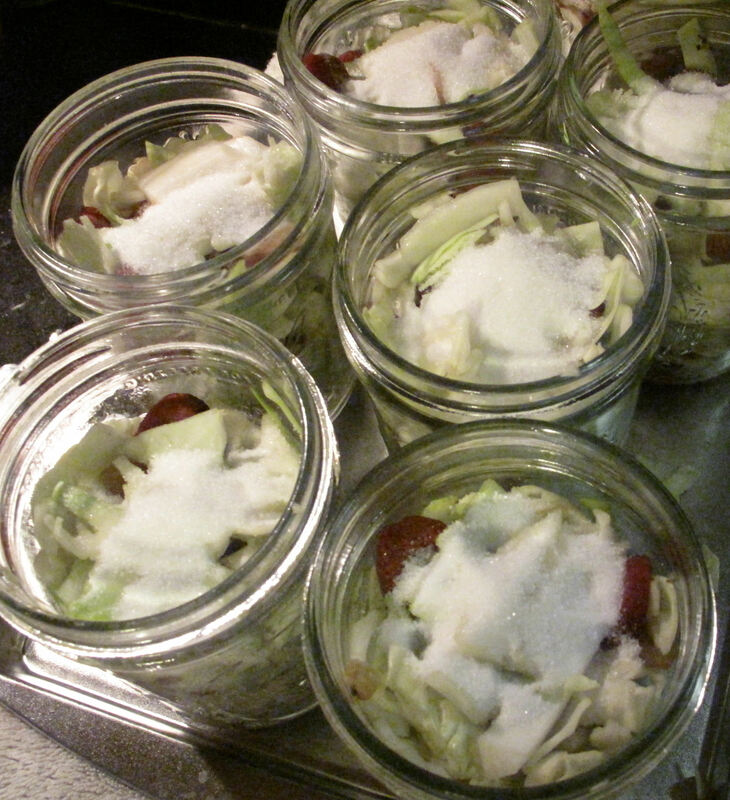 Place the lids and rings on the jars as usual. Finger tight! Place into your pressure canner and follow the manufactures instructions from there. You will can quartz at 10 lbs for 25 mintues and pints at 10 lbs for 15. Yum! These are huge hit and a blast from the past that everyone loves! 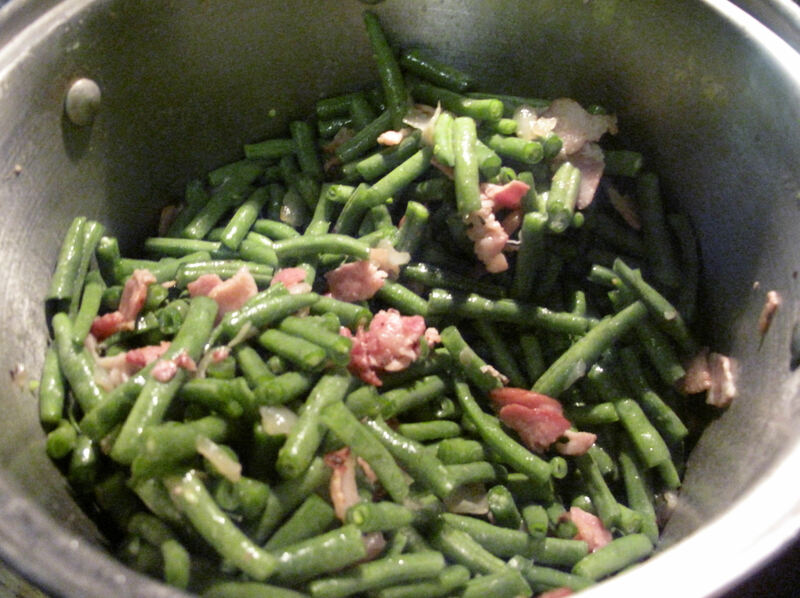 Of course you could use ham or something else if you wish, add your own seasonings, whatever…I have canned green beans just using the regular seasonings I would use in cooking too.